I had a "to do" list yesterday. #1 on the list was taking the care in for servicing in prep for the trip to Fl. I got to Honda bright and early-8AM. And it went downhill from there. I was presented with a list of needs with a hefty total. But I did agree to the brakes..after all I am not stupid. I don't want to coast into the Gulf of Mexico! At any rate, then I called Laurie and asked her if she would pick me up. How long can you sit in a waiting room. I only had 2 magazines with me. She did and it was an interesting trip back to Alpharetta what with Lilly in the backseat attempting to drive! Lilly is not yet a good traveler in the car and poor Laur was really stressed. We went to obedience class. Lilly did better at that-actually she was the best one in the class. But there were only the 2 dogs. Thank goodness I have cats! Another stop to pick up antler chew toy for the girl-she has gone through all of her other chew toys. Then we went to pottery. I met lots of Laurie's pottery people. It was kind of like quilting with dirty hands! It was very interesting to be an observer in this class as these are all experienced potters. I watched some pieces being created, others trimmed. While I was out with Laurie, Cindi called and she was at Sweet Home. I made her go check on Jelly rolls to see if anything new had come in since I was last there! She also called later on in the evening and reported on her purchases. She did good!!! So after Laur took me back to Honda, I came home and pretty much collapsed. Laurie wore me out. And last evening 2 of my favorite movies were on- Sleepless in Seattle and You've Got Mail. I have seen both about a gazillion times. I ended up doing some serious sleeping on the couch and woke up after one in the morning to move into the bedroom. I just read Laurie's blog. I too can remember specific moments in time. And I add the day that Kennedy was shot to her list. Is it possible that once again Camelot has returned? So much hope and enthusiasm surround yesterday's events. One can only hope. But then again, I remember the dark days following the assassination. We got to watch the swearing in and speech. I watched it with a couple of my residents. One of them fell asleep. Don't worry, Barak is on the job! MD appt yesterday afternoon and surprise, surprise the BP is up! I love my job. Thank goodness vacation is next week. In the meantime, I need to try to get the stress down. I will not let this job kill me!!!! (Who will take care of my guys)? It continues to be way too cold her in ATL. Come on warm weather. I hate it. Temp is 24 with a wind chill of 11....will it never end? I HATE THE COLD-THAT'S WHY I LEFT NY. Okay, I am finished whining now but honestly I am not happy. All I want to do when I get home is hibernate under the quilts on the couch. My friend Kathy has a facebook account and added me as a friend. It only took me two days to figure out how to respond. Then I forgot my password and had to reset. I think I am a better blogger! Other news regarding 2 of my granddogs: dumb and dumber. Sorry Laur. Gretch thought it was maybe a dominance thing. Since you are the alpha dog at your house, maybe Lilly is confused. And I know that Lainie is just plain dumb. Not to be outdone, Henry has recently developed a new hobby. Escape to the garage when I open the door to put something in the garbage. I can't figure this out. It is quite cold out there and then I have to chase him back in the house. My biggest fear is that he will do it when the garage door is open. Then I will be in real trouble. i guess we have to have a sit down talk about this...right after I have my coffee! The Saturday Thimbles gathered today. What fun!!!! The Most Exalted High Thimble was in rare form. AND she gave me demerits and I wasn't even talking. It was so great to be back with old friends. The project for this month is pictured. I have already had to "unsew" it twice. It is really challenging me today. I really like Bonnie Hunter's new mystery quilt (not a mystery anymore). But I began it before all the steps were posted. At any rate, I have been collecting the fabrics for it. I needed to buy some as I do not have much of the type and color of the fabrics she selected. At any rate, I began construction. Step one is the square in a square with a blue center-I need 130 of these blocks. 60 more to go and step one is completed. Step 2 is another 130 blocks with a brown center-not started or even cut yet. Step 3 is the tiny pink nine patch. I have one completed. I wanted to see what it would look like! All of the blocks are 31/2 blocks unfinished. This is not one of those tops that will be done quickly!! Today is Thimbles.....wootwoot. I have been waiting all week long for this. 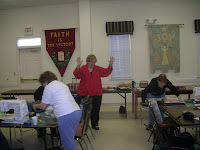 I can't wait to see all of my quilting friends and catch up. I have missed this group. Most of us are former Sisters I think. At any rate..Gretchen, Becky, Cindi and all of the others-can't wait. And as for the Most High Exalted Thimble...missed you most! See you later..
Just when I thought work couldn't get more anxiety provoking...it did. It started bright and early this morning-before 9AM. One of the middle management people from SoCar came to our morning meeting and announced that since that state had frozen medicare/caid rates, the company was seriously in a deficit and so all of the facilities needed to step up and save some money. 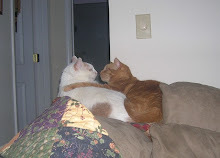 What it amounted to was the elimination of 2 positions within our facility. One of them is the admission coordinator (which makes no sense at all-but what do I know). The other position was the third case manager. Now I understand yesterday's events. So thank you very much, I now have pretty much tripled my case load Ahh job security....right! Then about 11:30 a state surveyor arrived on a complaint. Could things get any worse today? but after a short investigation and about two hours, she was gone and the complaint was not substantiated. 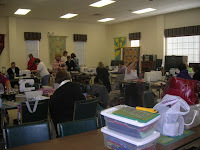 Come on Thimbles weekend.....I need to be with friends and lots and lots of fabric. 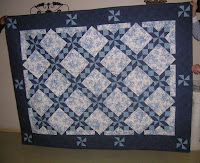 I think now I just might need to go into my sewing room and make a few more of those step one blocks in Double Delight. So far, I have 4. 116 of these bad boys to go and ten I can do step 2-that would be another 120 blocks. Here is the quilt-pattern is designed by our own Pat AKA Most High Exalted Thimble formerly known as Sister Superior. It is her pattern Star Gazing. The fabric is of course Moda-the American Primer line. Love this quilt. Peggy Barkle did a great job quilting it. This is the disappearing nine patch made from charm pack I picked up last summer. I think it is a Kansas Troubles line but am not sure. The committee at Sweet Home plus Becky helped me perk it up. I am so glad today is over. I am whipped. It was not a good day as a co-worker "resigned". It means more work for me thank you very much. And I have vacation the week after next. What were they thinking! And it is not like people are lining up to do this job. Last time it was a couple of months before the job was filled. Oh well...life goes on! 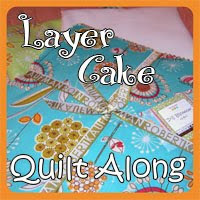 I think I will go cut more little bitty pieces for Double Delight! 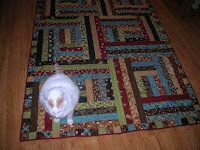 Spiff is checking out the completed quilt. I think I will call this one lotta latte. It is the Bistro line from Moda and the pattern is a modified log cabin type pattern. A real quickie! Very lazy day today (since it started so early). I never bothered to get dressed. I worked on the disappearing nine patch top by modifying the firecracker pattern. I have the center together and now just need to put on the borders. I also messed up the kitchen-the table is once again full of fabric in various states of chaos! Oh well-tomorrow is another day! It is 3AM and I am wide awake. I decided to get up before I really realized that it was only 3AM I really need to do something about this sleep pattern but I don't know what. My doctor was making rounds at work the other day and I asked her what she thought about melatonin. she said it wouldn't hurt but probably wouldn't work very long. And I never got around to getting any. I really don't want to take anything stronger for sleep. Oh well. I do sleep in the early evening and quite soundly on the couch. 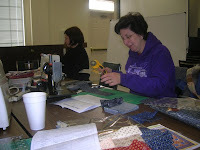 After I got back from Sweet Home yesterday and piddled around some, I started cutting some fabric for Bonnie's quilt. Thanks to Becky, I figured out how to download the directions without chopping of the right margin. Now when I read them, I don't have to decide how the sentence ends! 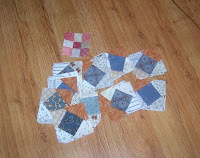 I cut the indigo squares for step one and the cheddar triangles. Also some of the neutral triangles but I don't have enough of that fabric by a long shot. I made one block in step one. 119 more to go! Then I went to find Carolina Crossing to see where I stopped on that one. I am still on step 2 of that project. Forgot one purchase yesterday at Sweet Home. I did buy into the new program Sweet Deal. It is her new discount program and the card it good for 6 months. It is a good deal for me as I seem to be spending more time out there! Guess I will go cut some more triangles and make a pot of coffee since I seem to be up for the day. This morning Becky and I drove out to Sweet Home. Gee I haven't been there in a week! And she is at it again. She's getting the new stuff in now that inventory is over. Yup-I am in trouble. 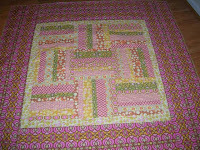 Moda's Zippity doo dah is in and she is loaded-jelly rolls, honey buns and lots of different yardage. So she says, "Look at this cute pattern using the honey buns." If I had a basket, it would be in. 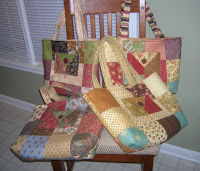 The pattern is called Dutch Treat by Pieces of the Heart. I am going to use the beige for the background and the dark fabric with tan and red flowers for the border. 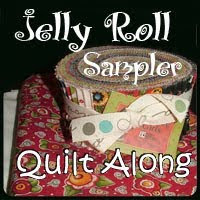 And of course, I need a jelly roll of it just because....you never know when you will need one! I picked up 3 random pieces of fabric for the challenge block for the workshop. They are the pieces of batik from last year's Shop Hop. Also needed one more piece of fabric for one of the FL projects-I decided to get one of the pieces from the American Primer line. I took out the blocks that I started a couple of months ago using charm pack material-and a disappearing 9 patch pattern. When I made the blocks, they were so dull and drab, they have just been sitting around. 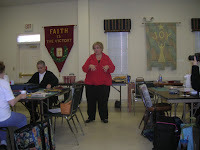 We had a committee meeting at the shop and I am going to modify that firecracker pattern (I hope)-that is the blue. I will also use that as an inner border. The dark red will be the outer border. So when are these projects due to be completed????? We won't even go there! Now I am home and I don't know which project to start first. 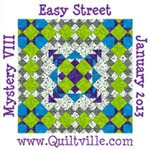 Also Bonnie's mystery quilt steps are all up and on line. I really like the quilt. Have I even cut one piece of step one? That would be a big no. I guess I had better get cracking!! These are the bags made as presents for friends. They got them yesterday, so now I can show them off! 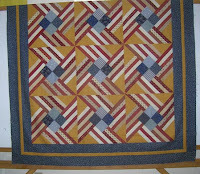 Kris's quilt with the Amy Butler fabric. Pattern is one that Kris downloaded. First quilt completed for 2009!! Monday after work I picked up 3 quilts from Peggy-Obama Blue, Bistro cabin and Kris's Amy Butler quilt. When I got home, I was unable to find the binding for Kris's quilt so I called her. I had for some unknown reason, given the fabric for the binding to her. And she used it. Bummer. so Tuesday after work, I head to Intown to see if I can replace it. I ended up deciding to use the same fabric as the backing-not the original plan but I think it actually works out better! I made the binding and now have all of the bindings stitched onto the quilts...on to the hand sewing part. I enjoy doing this while watching tv. And it keeps me from falling asleep before 10 PM. Only problem is that I end up with my hands aching...which is why I have given up sewing for the night tonight. I just took some tylenol extra strength and hopefully it will kick in soon! Blogging buddies attention...Melisa is at it again!!! She has 2 new programs which sound like a good deal. Go to the Sweet Home web site to check them out. More reasons to have to go to Sweet Home! 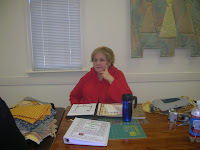 I need to go this weekend anyway as I need one more piece of fabric for the workshop in Fl. If I don't see the sun soon, I think I am going to totally lose it. I am glad for the rain as Lanier is now up almost 2 feet. But it is so gray outside. I hate the winter season, I think I have seasonal affective disorder! Kathy-be on the lookout for a package. I finally got it mailed today. So I guess it was a rather productive day after all. One thing not accomplished today was to drag the darn white wire reindeer back into the garage. I never even turned them on. However, I have managed to put away the wreath over the fireplace. I put it up before last Christmas and never took it down. Sarah called me up the other day and asked me how many boxes of Girl Scout cookies I would like to buy. You know you are old when it is the granddaughter selling the cookies! When it was safe to come out again, I found the toys too! Yum. Mom listened to you and today the postman brought us a package. 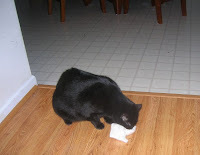 When the doorbell rang, Spooky went and hid so he does not know yet about the goodies. We love them a lot. They smell sooo good. It was cold last evening and so I cozied up under one or two of my quilts on the couch and watched some mindless TV. Add a cat for comfort (Henry) and we were soon asleep. I woke up before midnight and moved into the bed. I don't think I was awake for the descent of the ball, at least as this point my memory fails me! So onto resolutions....I REALLY should consider this year. The first one-to complete some of the projects I have started in the past few year. I did a soso job in 2008 on this one by completing a lot of quitls but probably more of them were new ones than old. Sooo this year, for every 2 new quilts (more realisitic), I will finish one of the old ones. I also need to get control of the sewing room. It is BAD-the floor seems to be shrinking!